My oldest is apparently afraid of trains. This morning in a stroke of genius I came up with the idea of purchasing one way train tickets for my two kids and I to go over the mountains to visit my in-laws. The price would be low and it would only take a couple of hours. I was all excited about the idea, until I told my oldest after he woke up. He looked at me and walked away. My husband tried reasoning with him this evening, and he is somewhat willing. We will see. I am biased since my dad worked for the rail road before I was born and starting from the time I was 10 I took the train over the mountains in Washington State to visit my grandmother and aunt. Apparently you have to have an adult with you now, or that was just the 80's and things were very different. Hopefully he will eventually change his mind and love taking the train as much as I do. One thing my son does love is to cook with me. From the time he could crawl he has been more than willing to help in the kitchen. Tonight he helped me to make a new recipe for Asian Chicken Thighs from the June/July issue of Taste of Home magazine. This recipe has 15 ingredients. It takes 65 minutes of total time, 30 minutes of which is active and makes 5 servings. As I normally do I made a few changes to the original recipe. First, I only used 4 chicken thighs since the ones I found were very large. Secondly, I used fresh squeezed orange juice. It is much cheaper to buy one orange than a whole container of orange juice, plus the taste is better and it is all natural. I was out of reduced sodium soy sauce so I used regular. Finally, to thicken the sauce I removed the chicken thighs and reduced the sauce and then poured it into a gravy boat to pour over each serving at the table. The sauce in this recipe was delicious. It was great with the chicken or just by itself with rice. The chicken was very tender and fell off the bone. With 25 grams of protein per serving this is a nice protein rich meal. In addition to being delicious it is also child friendly, my two boys loved the recipe. For the recipe go to Asian Chicken Thighs. A train ride over the mountains would be delightful. I am sure you will be able to convince your son. Your Asian style chicken thighs rock. Thanks for sharing. Hopefully :) My youngest has always been the less adventurous of my two boys! Aww, poor buddy. I think my son might be hesitant about it too. The recipe sounds delicious and I'm glad you had a nice time making it together. oh my goodness Ann your food always lift my spirits. I decided to go on a diet after the 4th July because I so need to lose weight and your recipes aren't helping me. :) I hope your son changes his mind about traveling with you. Would love to see those pics from the train ride. I've never ridden far on a train before (the subway in NY doesn't count). Hope you're having a great week so far! I rode the train from Seattle to West Virginia so I have been on a very long train ride :) It took about a week and was beautiful! Good luck with your diet. It might seem that I eat a lot of things, but most of the week I eat very healthy so I understand! Thanks for the sweet comments, I really love hearing from people that read and enjoy my blog! Have you been to Cass Scenic railroad? I went as a kid. It was so beautiful in the fall! The sauce on your chicken looks divine! My oldest has. My inlaws live in Nicholas County so it isn't far from them. He was pretty nervous apparently, but did fine once the train started moving :) I agree that it is beautiful in the fall when all the leaves start turning! You've had some awesome ideas lately. I normally don't feel all that inspired to cook in the summer but you've changed that! Thanks :) I understand about being uninspired during the summer, I am the same way! Poor kiddo! My son has been begging us to take him on a train! This looks just amazing Ann, I'm off to pin it now! Aww, sometimes trying new things can be scary! The problem with new things, like new foods, is that you don't know if you like it until you try it! Best of luck! It is scary to try new things. He is normally a trooper though so I am sure he will be fine once he actually takes a train ride! I used to take the train to visit my cousins in DC all the time when I was a kid. These days I much prefer to drive. I hate driving, I'm weird :) The train doesn't make me car sick, but the car does, it's no fun! Living in NYC I take trains and subways all the time. Hopefully he will ride and get over his fear. With this heat out I just don't want to cook a lot! It was in the 90's here with nasty humidity all day, so I completely understand! I just love this recipe! I bet it has great flavor, I'm drooling over my keyboard here. I was also afraid of trains when I was little, but I got over it during my first train ride, at least that's what my mom told me. My father and then brother worked for the trains as well. Once you get your son on board he will love it. Just like I love your recipes. Can't wait to try this one! I think once he's on the train he will be fine. Thanks for such sweet comments! Thanks :) I agree it would be a great adventure for him! 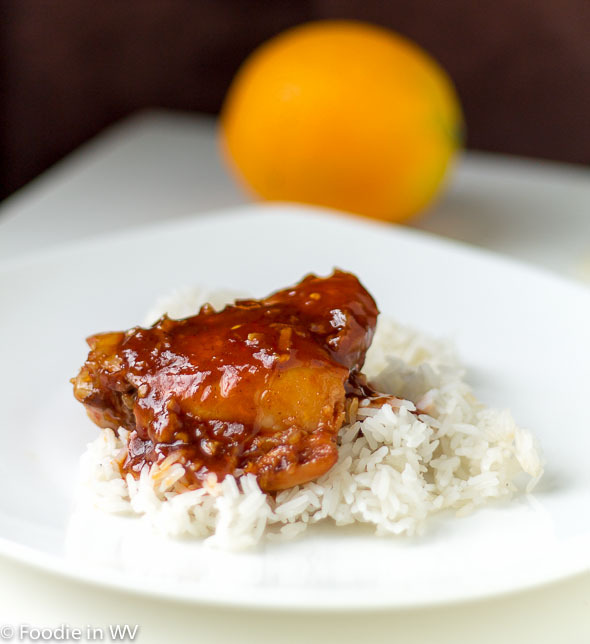 Your Asian style chicken thighs look mouthwatering! They are really easy too, which is nice for a weeknight meal!